Vintage Sterling Silver Caithness Millefiori Ring. Vintage late 1970's Caithness Millefiori glass, sterling silver dress ring. Vintage sterling silver Caithness ring. Formed from sterling silver with a large claw set Caithness millefiori glass cabochon. Fully hallmarked for sterling silver 1979 with CG makers mark for Caithness glass The ring is a UK Size N 1/2, US size 7. Ring Size UK N 1/2, US 7. Sterling silver Caithness glass millefiori ring. 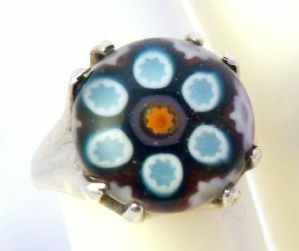 Circa 1979, sterling silver, Caithness glass millefiori statement ring.